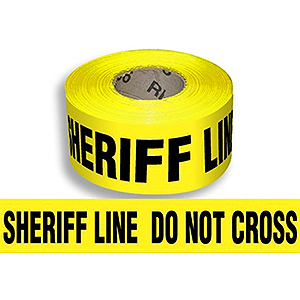 PRODUCT: YELLOW "SHERIFF LINE DO NOT CROSS" BARRICADE TAPE 3" x 1000 FEET, 3-MIL. 8 ROLLS/CASE. PRICE/CASE. Bright YELLOW Tape Repeats SHERIFF LINE DO NOT CROSS continuously in black bold letters over bright yellow tape.